Wendy Lewis interviews CoolSculpting veteran Keith Sullivan to get the skinny on what makes ZELTIQ so unique. Keith Sullivan is having a very good year. 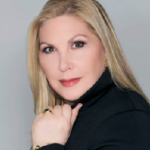 He was recently named Chief Commercial Officer and President of North America of ZELTIQ® Aesthetics, and launched a $45M direct to consumer program. After a meteoric rise in the company since he joined in October 2012, he is more than ready for his next challenge: helping ZELTIQ change the industry standard of what aesthetic providers can expect from medical technology companies. Founded in 2005 in Pleasanton, California, ZELTIQ Aesthetics (ZLTQ) has been dedicated to the development of a non-invasive fat reduction empire. For anyone who has been living under a rock for the past decade, their signature technology utilizes Cryolipolysis® that was designed to target only fat cells, leaving the skin and other tissue intact. Drs. Dieter Manstein and R. Rox Anderson at the Wellman Center at Massachusetts General Hospital conducted the initial Cryolipolysis research. In 2009, they received a CE Mark and in 2010, they got their first FDA green light. The company had a bright future and went public in October 2011, to the high hopes of early investors. Regrettably, post IPO they had a disappointing downward slope and missed their numbers for the next two quarters. In August 2012, Mark J. Foley was appointed as President and Chief Executive Officer, having previously served on the Board since 2009. 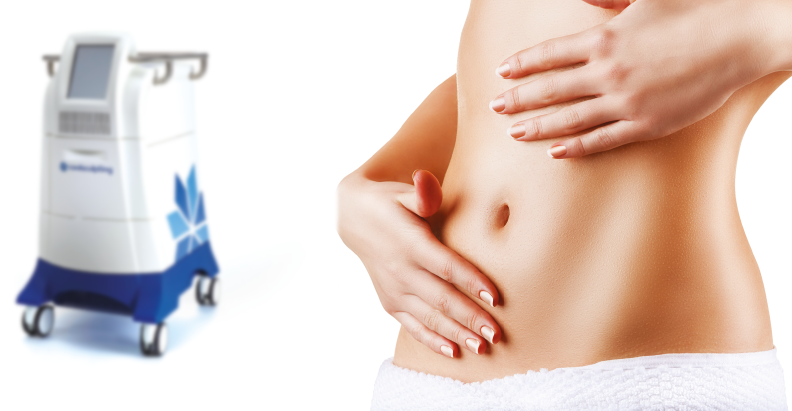 At that time, CoolSculpting had 400 systems installed internationally. At that year’s ASLMS meeting, dermatologist Jeffrey Dover of Skincare Physicians in Chestnut Hill, MA, who served on the medical advisory board, introduced Mr. Foley to Mr. Sullivan. As they say, the rest is history. Sullivan joined ZELTIQ on October 1, 2012 as Senior Vice President Global Sales, and 6 months later, he took over marketing as well. In 2014, they reached their first major milestone of a cool million treatment cycles, and the following year, they hit the 2,000,000th mark. Fast forward to 2016, and over 11 years, the company has strategically grown the CoolSculpting brand to be the #1 non-invasive fat reduction procedure with 3 million cycles performed globally, leaving many other fat reduction technologies in the proverbial dust. To date, the clinical evidence behind CoolSculpting technology has been published in more than 60 peer-reviewed abstracts and papers1. As an aesthetics industry veteran of 28 years, Mr. Sullivan offers a fresh perspective on the device industry as a whole. ‘When you look at the devices that have been put out in the field, there is a typical cadence in this industry; you develop a box, you sell it for $100,000, and three years later and you come back and try to sell the customer a new box that does basically the same thing but better. The changes in the products were just a spray paint job,’ he says. ‘We made our physician partners a big promise; you buy my system and we’re going to drive patients to your door. ZELTIQ has actually been able to deliver on that promise,’ he continues. ‘We focus on providing them excellent training through our team of Practice Development Managers whose sole job is to reinforce the training methods of CoolSculpting University,’ says Mr. Sullivan. ‘When I look at any product, if they have one differentiator that separates them from anything else in their class, they are lucky. I think we have developed a series of unique differentiators. There have always been promises made in the industry but very few companies lived up to them. We have 17 unique differentiators while most companies try to strive for one,’ he adds. 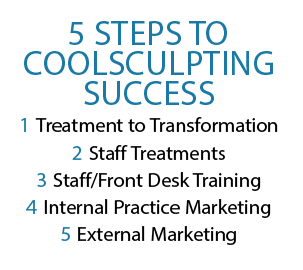 Among the CoolSculpting’s most notable developments has been the addition of a team of nearly 100 Practice Development Managers who generate physician and staff training as well as patients. ‘We literally drive patients to our customers’ doors, within the practice and outside the practice,’ says Mr. Sullivan. CSU is a classroom facility located at the ZELTIQ mothership in Pleasanton, Calif., with a second location on the east coast in Reston, VA. It’s an intense two-day curriculum. Mr. Sullivan estimates that 30% of attendees are physicians, and the rest are nurses, aestheticians, and techs who typically perform the treatments. When a practice buys the system, it’s normally part of the package, which is a value of $1,500 per class per person. They also invite existing customers to come. ‘If you attend CSU, your business goes up 90%; it virtually doubles. That’s how confident they are immediately,’ says Mr. Sullivan. Each class holds 40 people and they are typically sold out 90 days in advance in each of the three classes held per month on each coast. ‘Now we’re taking that concept globally in all regions in the world. When people come out of there, they are very confident about performing the treatment and getting good results,’ he adds. Mr. Sullivan believes that the staff is the best advertising a practice can have, and they give away treatments to staff. The PDMs work with the practices and train the staff on how to answer the phone and talk to patients when they are assessing them. According to him, the biggest success is from Cool Event patient seminars within the practice by segmenting their database to target specific groups of patients, such as men, moms, and millennials. He considers it to be the most effective tool for practice growth. The penalty is the actual cost of the treatment to the practice, which impacts the bottom line. For example, he explains, a CoolMini™ treatment costs $300 cycle and the practice is charged $150 if they follow their policy. If they choose not to follow the company’s policy, and do it three times, they are charged the full list price for 6 months of $300 per cycle. In 2015 CoolSculpting had two violators, and so far in 2016, they have not had one practice that was put into the penalty box. ‘We’re trying to do all the things that everybody promises accounts, and we are actually doing it,’ says Mr. Sullivan. For example, a lot of companies feature co-op marketing programs, from skin care brands to injectables and devices. 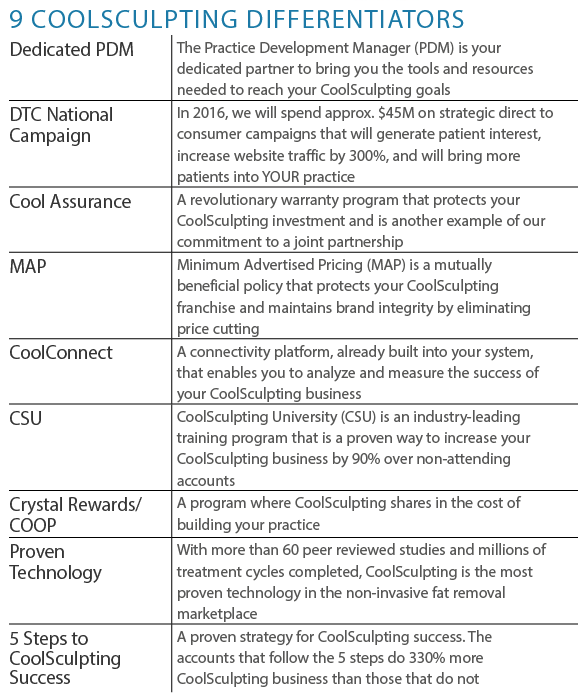 CoolSculpting customers get co-op dollars once they reach a certain level. ‘We spent about $14M in 2015 to support our customers with their marketing campaigns, that included billboards, print ads, local TV and radio, and much more,’ he said. ‘Our focus in not putting a second generation system out there, but rather making the box they have more profitable by adding new applicators,’ says Mr. Sullivan. That strategy is a home run, as they have consistently launched new and improved applicators to meet their customers’ demands. ‘Now we can go back to the same patients who have already been treated and treat them in another area,’ he says. ‘Another important consideration for every new device is staff training. I sent my lead nurses to CoolSculpting University shortly after I purchased my devices, which gave my team the foundation on which to build their expertise in the technology and treatment planning. It’s a great training program where they learn from the company’s top trainers and interact with staff from other offices to compare techniques. Plus my staff can also access videos to review procedures and techniques,’ she adds. Minimal advertised pricing is another sign of the company’s commitment to customers. ‘Whenever I purchase a piece of equipment, I have to be concerned about the commoditization of the procedure — low overhead spas and ‘docs in the box’ offices with low overheads start doing the procedure and drive the price down. CoolSculpting’s Minimum Advertised Pricing (MAP) virtually eliminates price cutting, which protects my investment while maintaining brand integrity,’ says Dr. Waldorf. According to the American Society for Aesthetic Plastic Surgery (ASAPS), the most popular surgical procedure in 2015 was liposuction with 396,048 procedures performed, and the most popular surgery in the 35-50 as well as the 51-64 age groups2. I asked Mr. Sullivan how he thinks CoolSculpting is impacting the liposuction market. ‘If a patient comes into your office and wants liposuction, we say that you should do it. We are not a competitor to liposuction. When we talk to physicians who do liposuction and also do CoolSculpting, we have found that their liposuction business actually goes up,’ Mr. Sullivan says. In fact, many plastic surgeons I talked to are big proponents of CoolSculpting and proud of it. New York City plastic surgeon David Rappaport has been performing body contouring procedures for over two decades, and jumped on the CoolSculpting revolution early on. After seeing the impressive results he was achieving with CoolSculpting since he bought his first machine in 2010, he founded Coolspa® in 2014, which has become one of New York’s leading CoolSculpting providers. He now has four machines in his Park Avenue location and keeps them going most of the time. 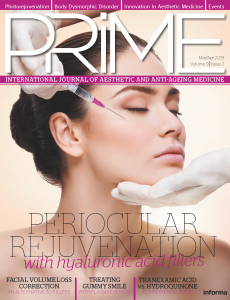 According to Mr. Sullivan, in the U.S., approximately 70% of customers are comprised of core specialties including plastic surgery, dermatology and dermatologic surgery practices. To address the numerous requests they are getting from a wide range of other specialties such as facial surgery practices, a novel stand-alone CoolMini system was developed especially for practices that only want to treat facial areas at a lower price point. In response to the demand to reduce the time it takes to perform a treatment, ZELTIQ launched a significant upgrade to the CoolSculpting family of treatment applicators, the 3 in 1 CoolAdvantage™ applicator launched at AAD 2016. Sullivan explains, ‘By changing the shape of the applicator cup to increase direct tissue contact and lowering the temperature, the CoolAdvantage applicator delivers the same or better results in just 35 minutes, cutting the treatment time nearly in half,’ says Mr. Sullivan. 2016 is poised to be a very big year for ZELTIQ. As expected, they are looking into the vast potential of expanding their indications. For example, their next targeted treatment just may be cellulite. They are looking into ways to modify the Cool Smooth PRO™ applicator that treats skin tone and texture for dermal thickening as early as 2017. According to President and CEO Mark Foley, their clinical investigators are also focusing on acne treatments by cooling the sebaceous glands, but this is on the docket for late 2018. After enlisting supermodel/actress/mom Molly Sims as their brand ambassador in 2015, they are forking over a whopping and unprecedented $20M in the first half of 2016 on a national campaign of billboard, digital and television advertising to drive consumer awareness in four test markets. In January alone, Coolsculpting.com had 700,000 unique monthly visitors, which is triple the number from January of the previous year.